*shuffles quietly in* Hello, it’s been a while. So back in the day, when I was actually writing posts (though I never really got above one every month at best), I did round-ups of postcode areas. London has a lot of them, especially when you consider the outer London boroughs, but it’s the way I’m organising my London Pubology website, which is these days where I’m putting most of my attention. Perhaps I will write more of these posts to highlight new areas I’ve added, and writing them may spur me to write more in general. In the meantime, think of this as a little pub-related walking tour of an area. This after all is how I experience bits of London sometimes, and it’s certainly how I experienced UB7, having ventured out to that part of the world for the first time ever yesterday, to take photos. Figure 91. 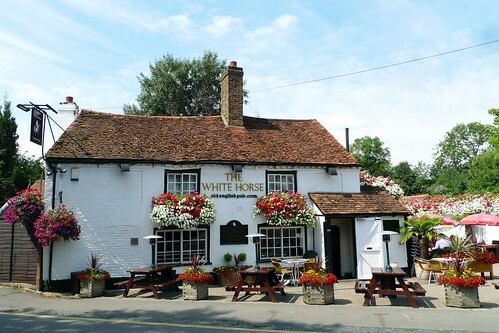 The White Horse (Longford UB7).